Eternal Father, you inspired the Virgin Mary, mother of your Son, to visit Elizabeth and assist her in her need. Keep us open to the working of your Spirit, and with Mary may we praise you for ever. We ask this through our Lord Jesus Christ, your Son who lives and reigns with you and the Holy Spirit, one God, for ever and ever. Amen. Today is Mary Beth's name day. When I was very sick and undergoing radiation treatments, there was just enough time alone on the table to say three Hail Marys and then to beg the intercession of St. Elizabeth, mother of John the Baptist. 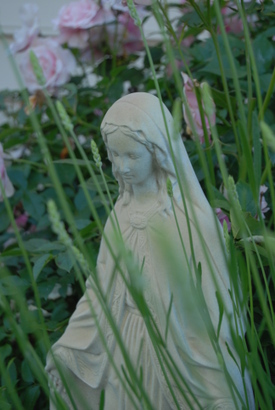 I asked her to please pray that God would make me, too, a "joyful mother of children." And in that brief time, I promised to name my first daughter for the Blessed Mother and St. Elizabeth. This is such a beautiful feast: a celebration of expectant motherhood and an exhortation to ministry. And my daughter, who is named for this special friendship, is the embodiment of those virtues of gentle nurturing and selfless charity. She is an answer to my most fervent prayers and a true joy! Do read Caryll Houselander's meditation on the Visitation.